Writing this Harry Potter guide was quite an undertaking. It was a difficult task, not only because there’s so much information to gather and share, but also because I’m so emotionally attached to Harry Potter and the wizarding world. Unlike most die-hard Harry Potter fans who started reading the books when they were children, I was an adult. However, much like those children grew up with Harry Potter, he came with me on a journey that was just as difficult. I was a newlywed, and then a new mother, and then a mother for the second time. Harry Potter got me through many long nights of breastfeeding my children. And I looked forward to having each new book arrive on my doorstep just as much as any kid. I can remember trying to prop up my infant son just after Harry Potter and the Order of the Phoenix arrived. We were sleep training him so no one was in a good mood, including him. I tried to keep him occupied so I could devour the book. Finishing it was painstaking, but it was worth it. The next leg of my Harry Potter journey began when I started reading Harry Potter and the Sorcerer’s Stone out loud to my son. By then, he was about 8 years-old, the right age, according to J.K. Rowling, to read her books. Now my children are teenagers. They’re still fond of Harry Potter, but I don’t know if they’ll ever have the same attachment to the wizarding world that I do. That’s my story. Here’s the story of the boy wizard and his creator. Disclosure: The links in this blog post are affiliate links, which means Media Medusa earns a small commission when you buy something using these links. “Mr. and Mrs. Dursley, of number four, Privet Drive, were proud to say that they were perfectly normal, thank you very much.” That’s the first line of Harry Potter and the Sorcerer’s Stone. Who knew that such a simple line would kick off a worldwide phenomenon that will last decades? J.K. Rowling’s story if just as famous as the boy wizard’s. She was a single mother with a newborn living on assistance in Edinburgh, Scotland. She would feed her infant daughter, then push her in a pram to a local coffee shop, where she wrote the first Harry Potter book in longhand. I’ve seen her interviewed many times. As she says, it’s easy to forget that she had no idea whatsoever that she would every sell her book, let alone become one of the richest people on the planet. In one TV special, they took her back to that one-room flat. She cried, reiterating how desperate she was, how depressed. The J.K. Rowling from the past could just have easily slipped into obscurity, never earning enough for luxuries. The fact that she remains humble is one of the reasons her fans adore her. After several publishers passed her book over, she finally snagged a small publisher in England who produced a small number of copies. It wasn’t until Scholastic bought the U.S. rights to her book that Harry Potter mania took off. The initial print run was only 50,000. Compare that to 8.3 million – the number of Harry Potter and the Deathly Hallows books old in just 24 hours. 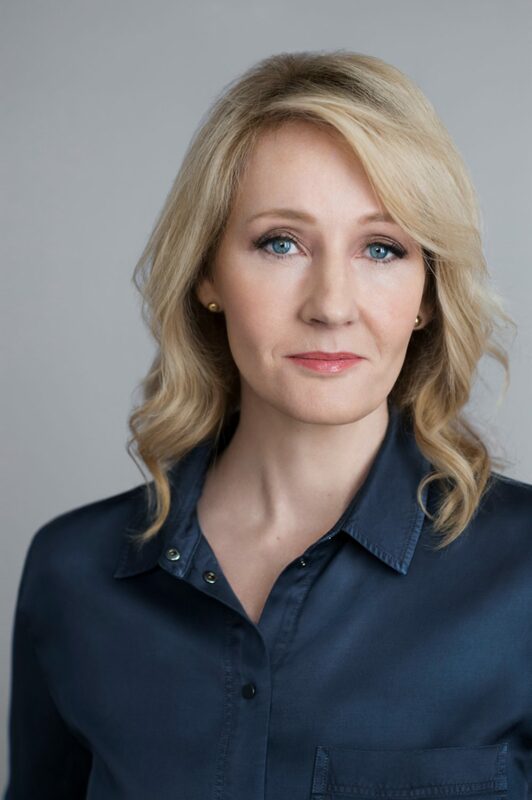 Fun Fact: J.K. Rowling and Harry Potter share the same birthday, July 31. J.K. Rowling started a charity, Lumos, in 2004. The organization’s mission is to “influence the world’s decision makers to support children in families and not orphanages.” Learn more about her charity. Here are the books in the Harry Potter series and the extended universe. I’ve included their original U.S. publishing date. Harry Potter and the Sorcerer’s Stone (September 1998) – Harry Potter learns that he is a wizard and leaves his miserable home life to enroll in wizarding school. Harry Potter and the Chamber of Secrets (June 2, 1999) – Someone is tormenting Hogwarts, and then things get dangerous. Harry Potter and the Prisoner of Azkaban (September 8, 1999) – Harry’s life is in danger (as usual), but his pursuer is also a tantalizing link to his parents’ lives. Harry Potter and the Goblet of Fire (July 8, 2000) – Harry is unwillingly enrolled in a dangerous tournament by someone with dark magic. Will he survive to find out why? Harry Potter and the Order of the Phoenix (June 21, 2003) – Lord Voldemort has returned, whether the Ministry likes it or not. But no one believes Harry and Dumbledore except their close friends. 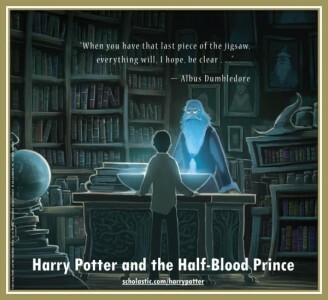 Harry Potter and the Half-Blood Prince (July 16, 2005) – Dumbledore reveals scant little about why he keeps leaving the castle. And Harry finds a textbook that seems to be a boon, but turns out to be a curse. Harry Potter and the Deathly Hallows (July 21, 2007) – The final year of Harry’s journey to meet the Dark Lord in battle. Fantastic Beasts and Where to Find Them (March, 12, 2001) – An encyclopedia of magical creatures in the wizarding world. Quidditch Through the Ages (March, 12, 2001) – A history of the wizarding world’s favorite sport. The Tales of Beedle the Bard (December 3, 2008) – Like Muggle children have fairy tales, little wizards and witches listen to these terrible tales. Short Stories from Hogwarts of Heroism, Hardship and Dangerous Hobbies (Pottermore Presents, Book 1) (September 6, 2016) – Self-explanatory. Short Stories from Hogwarts of Power, Politics and Pesky Poltergeists (Pottermore Presents, Book 2) (September 6, 2016) – Self-explanatory. 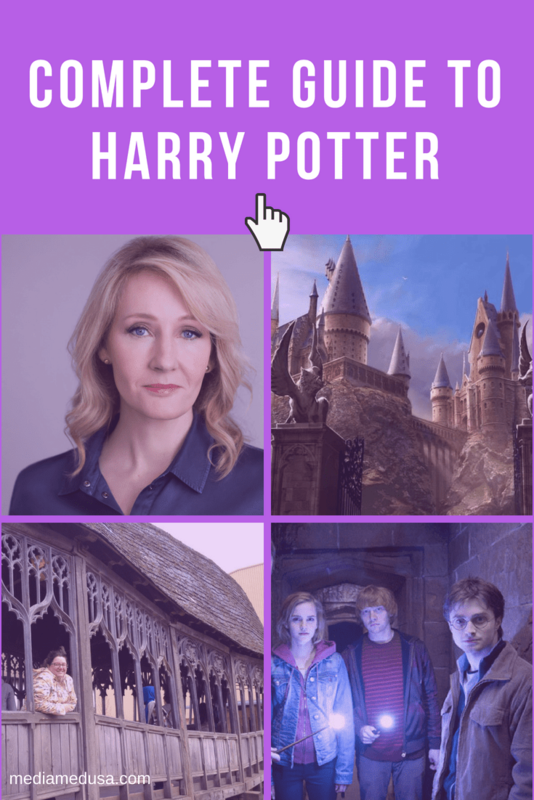 Hogwarts: An Incomplete and Unreliable Guide (Pottermore Presents, Book 3) (September 6, 2016) – The opposite of Hermione’s favorite tome, Hogwarts: A History. Harry Potter and the Cursed Child (Screenplay) (July 31, 2016) – Harry is all grown-up and has a family of his own, but danger still trails them. Fantastic Beasts and Where to Find Them (Screenplay) (November 18, 2016) – Pre-Harry Potter, Newt Scamander travels to New York City to capture lost magical creatures. Fun Fact: Look at the dates of publication for both Fantastic Beasts screenplays. The dates and the years switch places. Did you know? The Harry Potter series of books is free if you’re a member of Amazon’s Kindle Unlimited Program. Harry Potter and the Sorcerer’s Stone premiered on November 16, 2001. J.K. Rowling had worked closely with Steve Kloves, the screenwriter. The movie was directed by Christopher Columbus, whose production design decisions informed the entire rest of the series. The trio continued working together on Harry Potter and the Chamber of Secrets. But when Harry Potter and the Prisoner of Azkaban began production, Columbus stepped down and Alfonso Cuarón took the reins. Prisoner of Azkaban was a turning point in both the books and the movies, because they began to tell a darker story. Director Mike Newell stepped in for Harry Potter and the Goblet of Fire, all the while with Rowling and Kloves continuing to write the screenplays. Director David Yates, who took the helm for Harry Potter and the Order of the Phoenix, is credited with giving the movies and even darker, more sophisticated tone. This time, however, Rowling worked with Michael Goldenberg on the screenplay. Harry Potter and the Half-Blood Prince saw the dream team of Rowling, Kloves and Yates brought together. These three took the movies across the finish line with both Harry Potter and the Deathly Hallows movies. Nearly five years later, Rowling introduced the eighth official Harry Potter story to the world. Harry Potter and the Cursed Child is an original play in two parts, written by Jack Thorne, who collaborated with Rowling. The play bowed in London’s West End on July 30, 2016. Also that year, Fantastic Beasts and Where to Find Them premiered in movie theaters. Fantastic Beasts was the first wizarding world film that wasn’t adapted from a book, but was written as an original screenplay. 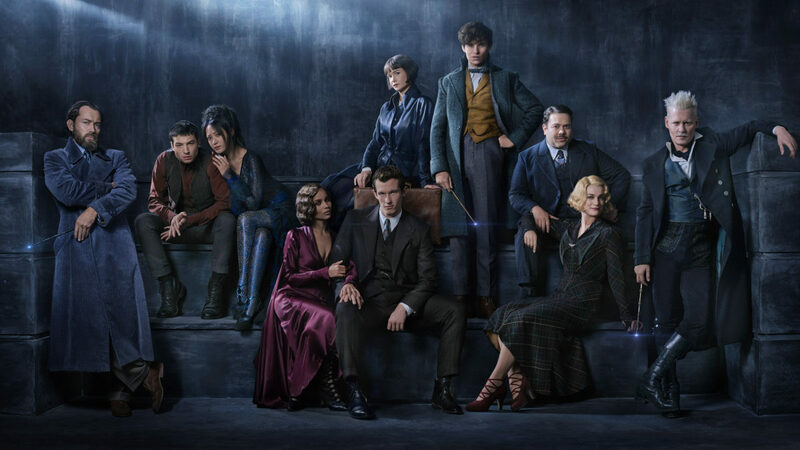 Fantastic Beasts: The Crimes of Grindelwald will premiere in movie theaters on November 16, 2018. Here is a list of live-action performances, listed as they would occur chronologically in the wizarding world story. Their premiere dates are also included. The cast of the Harry Potter movies grew up on screen. Much has been written about them, so I won’t write anything in-depth here. Needless to say, they were swept up in the phenomenon and forever changed (and rich). Instead, I will simply group characters as I see fit. First is the character name / followed by the name of the actor or actress who portrayed said character. 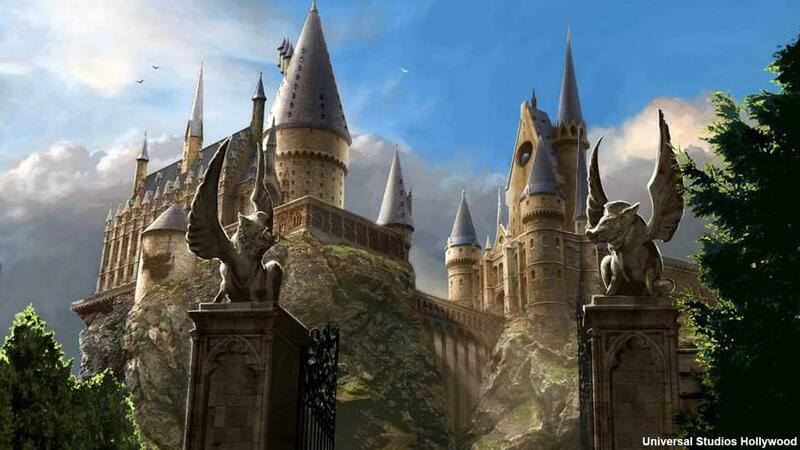 Harry Potter always assumed that Hogwarts was the only wizarding school on the planet. In Harry Potter and the Goblet of Fire, however, he discovered that there were other schools. Thanks to Fantastic Beasts and Where to Find Them, we’re now aware of schools in North America, as well. Sorting Hat: “Or perhaps in Slytherin you’ll make your real friends. Where would the students of Hogwarts be without their faculty? Probably off drinking a butterbeer at the Three Broomsticks. However, lessons must be learned. This list has the faculty member / their subject / and the actor who played said faculty member. 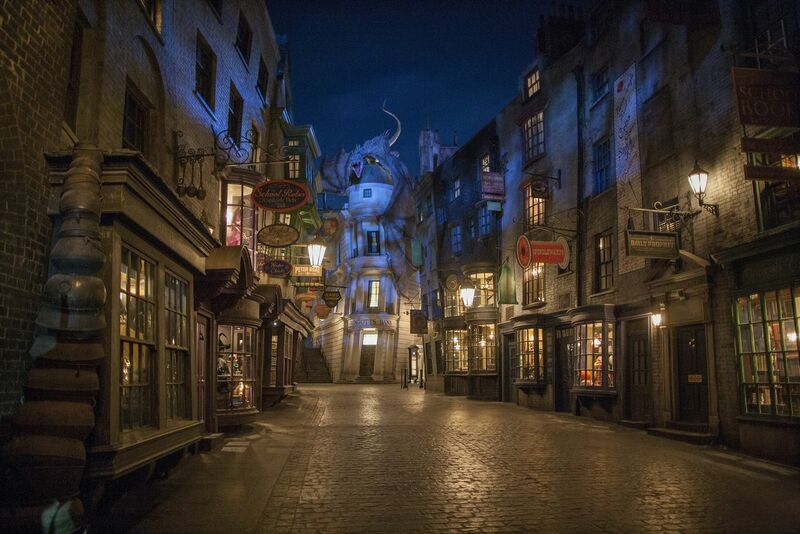 The shops at Diagon Alley, which lies just off Charing Cross Road in London, are hidden from Muggle eyes. You can only access Diagon Alley through the Leaky Cauldron. There, students can get supplies for their school year, and wizards and witches can deposit or withdraw from Gringotts bank. It is fairly obvious what most of these establishments sell simply by looking at their names. However, if nothing is obvious, I have included their merchandise after. UNIVERSAL STUDIOS HOLLYWOOD — Pictured: “The Wizarding World of Harry Potter: Madam Puddifoots” — (Photo by: Universal Studios) HARRY POTTER, characters, names and related indicia are trademarks of and (c) Warner Bros. Entertainment Inc. Harry Potter Publishing Rights (c) JKR. (s15) (c)2015 Universal Studios. All Rights Reserved. 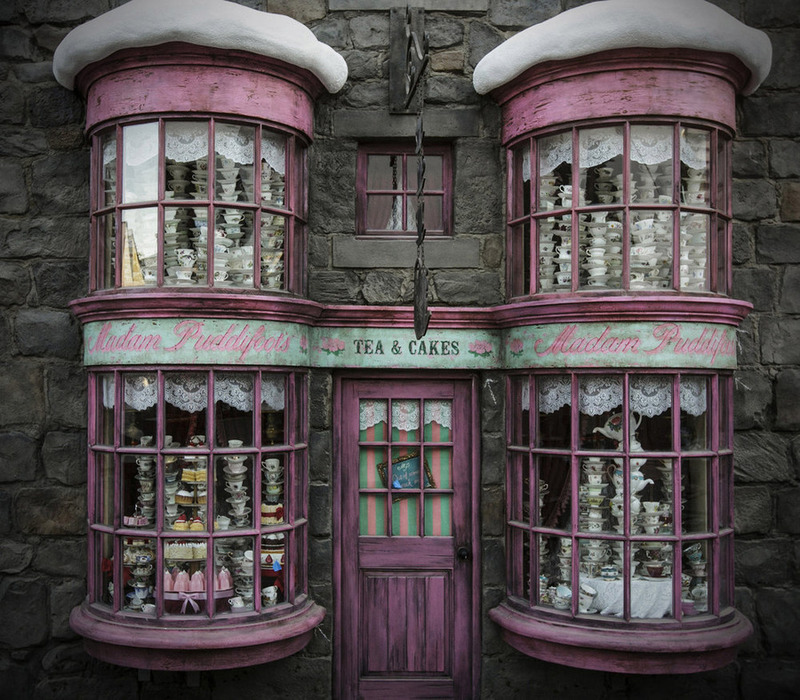 Hogsmeade is the only entirely non-Muggle settlement in Britain. Therefore, every shop, restaurant and tourist attraction is full of magic. Witches and wizards are free to use magic, as well. Beginning in their third year, students at Hogwarts are allowed to visit Hogsmeade on specific weekends, as long as their guardian signed their permission slip. It is fairly obvious what most of these establishments sell simply by looking at their names. However, if nothing is obvious, I have included their merchandise after. Pets play an important role in the lives of Hogwarts students, as well as some adults. Students are allowed to bring an owl, a cat, a toad or a rat to school. Some of the “pets” listed here were not allowed in Hogwarts, however. The Death Eaters were Lord Voldemort’s followers. Some did time in Azkaban Prison, while others denounced the Dark Lord and avoided punishment. This is a list of known Death Eaters / and the actor or actress who plays said Death Eater. This is not a complete list of spells. Being a mere Muggle, I couldn’t possibly know every charm, hex and jinx available to witches and wizards. However, I have compiled as many as I could. These online stores are the best I have found for their selection of Harry Potter merchandise, their customer service and their prices. Feel free to download this Harry Potter cheat sheet on .PDF. I hope this Harry Potter guide is a handy reference for you. What did I miss? Tell me in the comments! All photos and images courtesy of Scholastic and Warner Bros.